Go to original pattern for design DROPS Baby 14-29. DROPS pointed needle size 3.5mm (for rib) and 4mm. 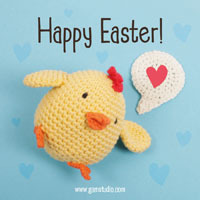 You can get the yarn to make this pattern from	28.80£. Read more. Knitting tension: 18 sts x 23 rows with 2 threads Alpaca on needles size 4.5mm in stocking sts = 10 x 10 cm. Note! The last buttonhole will be on the neckline. 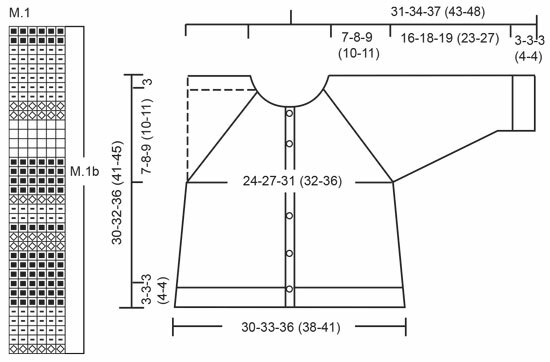 Decreasing tips (applies to raglan): All dec are made form the right side. Dec as follows in each transition between sleeve and body pieces (start 3 sts before marking thread): K2 tog, K2 (marker is between these 2 sts), slip 1 st as if to knit, K1, psso. Knit the jacket back and forth on circular needle from mid front. Remember buttonholes on right front band – see above. Cast on 132-138-150 (162-168) sts (includes 5 edge sts towards mid front each side, knitted in garter sts throughout) with 2 threads light turquoise (double thread) and needle size 4.5mm. 5 front edge sts in garter sts, *K2, P4*, repeat from *-* and finish with K2 and 5 edge sts in garter sts. Continue the Rib like this until piece measures 3-3-3 (4-4) cm. Now continue in stocking sts with 5 edge sts each side in garter sts. At the same time on the first row after the Rib adjust number of sts to 118-128-140 (146-158) sts – do not dec over the 5 edge sts each side. Insert a marker 32-34-38 (39-42) sts in from each side = 54-60-64 (68-74) sts between marking threads on back piece. When piece measures 5-5-6 (6-6) cm dec 1 st on each side on both markers on every 3-3-3 (4-5) cm a total of 5 times = 98-108-120 (126-138) sts. 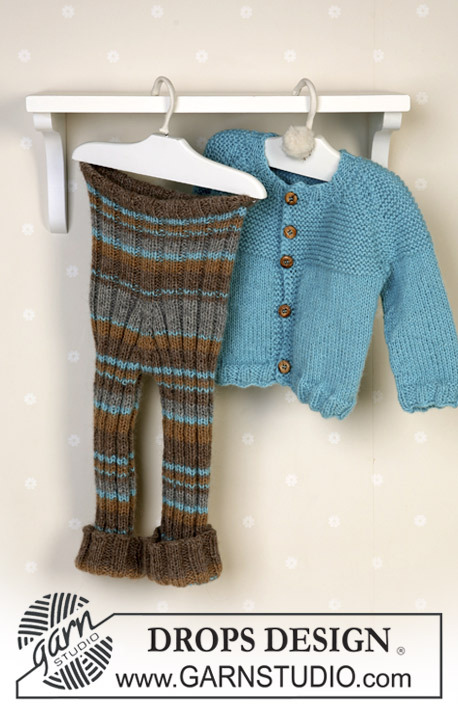 When piece measures 19-20-23 (27-30) cm – adjust so that next row is from the wrong side – knit 3 rows garter sts over all sts. On next row cast off 6-8-8 (8-10) sts each side for armhole (i.e. 3-4-4 (4-5) sts on each side of both marking threads) = 38-42-46 (50-54) sts on back piece and 24-25-29 (30-32) sts on each front piece. Put piece aside and knit the sleeves. Sleeve is knitted round on double pointed needles. Cast on 30-30-36 (36-36) sts with 2 threads light turquoise. Knit 1 round and continue in Rib with K2, P4 until piece measures 3-3-3 (4-4) cm. Now continue in stocking sts at the same time adjusting number of sts to 28-28-30 (30-32) on the first round in stocking sts. When sleeve measures 8-6-6 (6-6) cm, inc 2 sts mid under arm on every 7-4-3 (3-3.5) cm a total of 2-4-5 (7-7) times = 32-36-40 (44-46) sts. When piece measures 18-20-21 (26-30) cm purl 1 round, knit 1 round, purl 1 round and knit 1 round casting off 6-8-8 (8-10) sts mid under arm on the last round = 26-28-32 (36-36) sts. Put the piece aside and knit the other sleeve. Put sleeves in on the same circular needle as back and front pieces where you cast off for armholes = 138-148-168 (182-190) sts. Insert a marker in all transitions between sleeves and body pieces (= 4 markers). Knit garter sts over all sts and knit 1 row from the wrong side before starting the dec.
Dec 1 st on each side of all markers (= 8 dec per row) – see Decreasing tips – Dec on every 4th row a total of 7-8-8 (9-10) times and then on every other row 0-0-2 (2-2) times. Neck: At the same time when piece measures 25-27-31 (41-45) cm put the outermost 8-8-10 (10-10) sts towards mid front each side on a thread for neck. Now cast off to shape the neckline on every other row: 2 sts 2 times and 1 st 2 times. After all dec for raglan and neck are complete there are 54-56-56 (62-62) sts left on needle and piece measures approx 30-32-36 (41-45) cm. 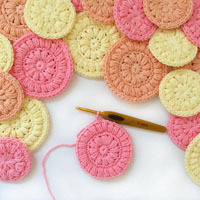 Assembly: Pick up approx 80 to 96 sts round the neck (incl sts on threads) on circular needle size 4mm with 2 threads of turquoise. Knit 1 row from the wrong side and 1 row from the right side at the same time adjusting number of sts to 54-60-60 (66-66). Continue in Rib as follows (1st round = wrong side): 5 edge sts in garter sts, *P2, K4*, repeat from *-* and finish with P2 and 5 edge sts in garter sts. After 1 cm make a buttonhole over the others on right front edge. Cast off loosely in rib when Rib measures 2 cm. Sew the openings under the arms. Sew on buttons. Knitting tension: 19 sts x 25 rows with double thread on needles size 4mm in stocking sts = 10 x 10 cm. 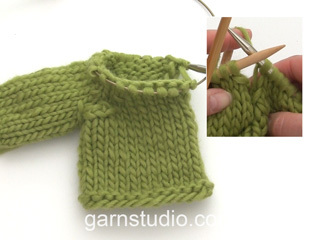 Increasing tips: Pick up thread from previous row and knit or purl this as it fits into Rib – i.e. knit the first 3 inc sts, purl the next 3 etc. Start at the top and knit downwards. Cast on 84-96-96 (108-108) sts with 2 threads beige-mix and circular needle size 4mm. Knit Rib. After 2 cm start the stripe pattern – see M.1, start at the bottom of chart. When piece measures 10-13-14 (15-16) cm inc 1 st on each side of the middle 3 knitted sts – see Increasing tips – on every other round a total of 12 times = 108-120-120 (132-132) sts. After the last inc piece measures approx 20-23-24 (25-26) cm. On next round cast off 5 sts mid front and mid back and finish each leg separately. Legs: Put sts from one leg on a thread and sts from the other leg on double pointed needles size 4mm = 49-55-55 (61-61) sts. Knit round (continue pattern as before) and on the first round dec the P4 on inner side of leg to P3 = 48-54-54- (60-60) sts. 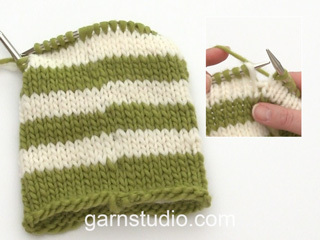 Continue in Rib and stripe pattern until leg measures 18-21-24 (29-34) cm. Change to beige-mix and knit 6 cm Rib for turn-up. Cast off loosely in Rib. Knit the other leg in the same way. Assembly: Sew opening between legs. Fold the upper 2 cm on waist towards the wrong side and attach neatly – leave an opening for the elastic and insert this. Fold the rib at bottom of legs. 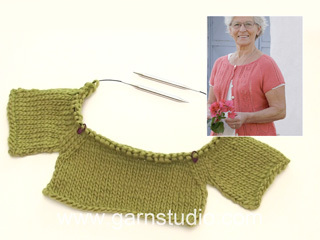 Knitting tension: 19 sts x 38 rows with double thread on needles size 4mm in garter sts = 10 x 10 cm. The bootie is knitted from top down and sewn together mid back afterwards. Loosely cast on 14-16-16 (18-18) sts with 2 threads of light turquoise and needle size 4mm and knit garter sts until piece measures 3-3-3 (4-4) cm. Put sts on a thread and knit a similar piece (= the upper part of bootie). Put the 2 pieces in on the same needle and knit 1 row garter sts over all sts = 28-32-32 (36-36) sts (the opening in the middle of piece = mid front). Change to needle size 3.5mm and knit next row as follows from the right side: 1 edge st in garter sts, *K2, P2*, repeat from *-* and finish with K2 and 1 edge st in garter sts. Continue the Rib like this until it measures 3.5-4.4.5 (5-5) cm. Now put the outermost 10-11-11 (12-12) sts each side on a thread. 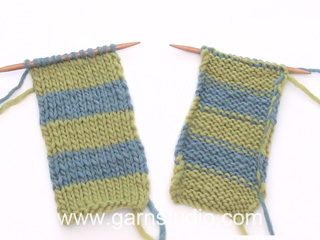 Change back to needle size 4mm and knit 4-5-6 (7-8) cm garter sts over the remaining 8-10-10 (12-12) sts mid front. Now dec 1 st each side on every other row a total of 2 times = 4-6-6 (8-8) sts left, cut the thread. Pick up 10-11-13 (15-17) sts on each side of the middle piece and put sts from thread back on needle = 44-50-54 (62-66) sts. Knit 3-3.5-4 (4.5-5) cm garter sts over all sts, at the same time after 1.5-2-2.5 (3-3.5) cm dec as follows on every other row until finished measurements: Cast off 1 st at the beginning and at the end of row and K2 tog on both sides of the middle st = approx 32-38-42 (50-54) sts left. Cast off loosely. Knit another bootie. Sew seam under foot and mid back – sew in the outer loops of sts in order to make the seam neat. Liebe Katharina, für die Raglanabnahmen sollen Sie 1 Masche abnehmen, nicht abketten - siehe Tipp zum Abketten - die deutsche Anleitung wird angepasst. Viel Spaß beim stricken! Hallo, ich fange jetzt das Oberteil an. Mein Nadelspiel für die Ärmel 4,5 ist ein klein bisschen dünner als die Rundstricknadel für den Körper. Wenn ich jetzt mit Rundstricknadel Nr 5 weiter stricke, ist der Unterschied dann nicht zu groß (man soll ja Nr 4 nehmen)? 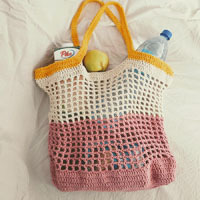 Soll ich vielleicht einfach mit der bereits verwendeten Rundstricknadel weiter stricken? Ich bedanke mich im Voraus für die Hilfe. Leider hab ich es nicht bemerkt. 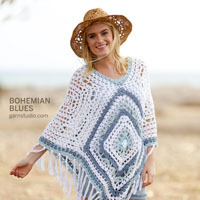 Liebe Sophie, die ganze Jacke wird mit der selben Nadel bzw Nr 4.5 gestrickt, am besten stricken Sie die Passe auch mit einer Nadel Nr 4,5 sonnst werden die Anleitung nicht mehr stimmen (mit größeren Nadeln wird die Maschenprobe nicht mehr stiimmen). Viel Spaß beim stricken! Pour la réalisation du pantalon, lorsque vous demandez d'augmenter une maille de chaque côté des 3 mailles à l'endroit, 12 fois tous les 2 rangs, je ne comprends absolument pas où je dois augmenter puisque je tricote en côtes 3/3. Après 12 tours d'augmentation, je devrais avoir 24 mailles en plus. Je ne comprends pas. Pouvez-vous me donner plus d'explications ? Merci ! Bonjour Mme Larose, vous augmentez de chaque côté des 3 m end au milieu de l'ouvrage - tricotez les augmentations en côtes (cf AUGMENTATIONS). Augmentez ainsi 12 fois 2 m = 24 augmentations = 108-120-132 m (cf taille). Bon tricot! Hvis jeg velger å strikke denne buksa i Drops Delights (som er et garnalternativ). Hvor mye garn beregner jeg i str 3-4 år da? regner med at man ikke trenger like mye som når man strikker den med striper. Hej Vibeke. Se de her bukser er strikket i dobbelt traad Delight. Jeg ville nok ogsaa tage et nöste mere, naar der strikkes rib, for at vaere sikker. God fornöjelse. Hallo Liebes Drops-Team, Wieso beantworten sie meine Frage nicht? Haben Sie die Maschenprobe auch wieder genau eingehalten? Ebenso das Längenmaß? Bislang hatten wir keine Rückmeldungen, dass die Garnmenge nicht passt. Hallo, ich habe die Jacke jetzt das zweite mal gestrickt, das erste mal in der Größe 6/9 M, kam ich mit der Mengenangabe. Jetzt allerdings habe ich die Jacke in der Größe 3/4 J gestickt und kam mit den angegebenen 250 g nicht aus. Ich habe ein Käuel Alpaca nachbestellt, was auch nicht reichte, ich habe jetzt den Hals mit einigen R weniger gestrickt. Kann es sein, dass die Mengenangabe 350 hier eher passen würde? Hei. I felletips står det at all raglanfellingen skjer fra retten, men det står at det skal felles på hver 4. pinne (?) da blir andre felling fra vrangen, skal jeg da felle på samme måte fra vrangen? Hej Hilde, Nej du skal felle fra retten. Hvis første pind er fra retten kan du fex felle på 1.-5.-9. osv da bliver det for hver 4.pind og altid fra retten. God fornøjelse! Men hvor mange nøster trenger jeg i str. 3/4 år? Hei Cathy. I opskriften skriver vi 150 gr af bundfarven + 3 gange 50 gr af stribefarverne. Men for en farve vil jeg tro omkring de 200-250 gram. Som sagt, saa tal med din strikkeforretning, de kan ogsaa sagtens hjaelpe dig med dette.